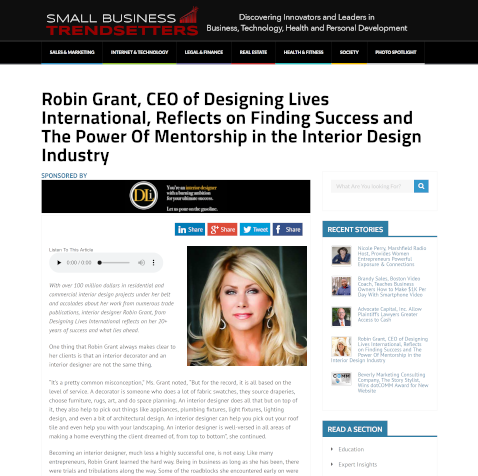 With over 100 million dollars in residential and commercial interior design projects under her belt and accolades about her work from numerous trade publications, interior designer Robin Grant, from Designing Lives International reflects on her 20+ years of success and what lies ahead. One thing that Robin Grant always makes clear to her clients is that an interior decorator and an interior designer are not the same thing. “It’s a pretty common misconception,” Ms. Grant noted, “But for the record, it is all based on the level of service. A decorator is someone who does a lot of fabric swatches, they source draperies, choose furniture, rugs, art, and do space planning. An interior designer does all that but on top of it, they also help to pick out things like appliances, plumbing fixtures, light fixtures, lighting design, and even a bit of architectural design. An interior designer can help you pick out your roof tile and even help you with your landscaping. An interior designer is well-versed in all areas of making a home everything the client dreamed of, from top to bottom”, she continued. Becoming an interior designer, much less a highly successful one, is not easy. Like many entrepreneurs, Robin Grant learned the hard way. Being in business as long as she has been, there were trials and tribulations along the way. Some of the roadblocks she encountered early on were due to building her business on her own. She started her own business because she thought she knew a lot about the interior design business. What she would soon discover is that running an interior design business takes a lot more than just be a great designer. With an overabundance of interior designers offering their services, she relied on word of mouth to grow her business. She also had to learn to network with builders and architects as a means to grow her business, her brand, and bottom line. Ms. Grant’s early years of struggle is a common thread among many entrepreneurs. Many times, new business owners fail to properly assess their strengths and weaknesses in business; often times trying to wear too many hats at one time. This approach can lead to unnecessary delays on the path to success. Experts agree that one of the best strategies to quickly achieve success is to seek the guidance of a mentor; a trusted individual skilled in all aspects of a particular business. When asked about their career paths, studies show that most successful entrepreneurs credit a mentor or mentors with helping them achieve their goals. No one learns in a vacuum, and it’s the people that are able to absorb the wisdom of others – and then, when the time is right, pay it forward by becoming mentors themselves – who set themselves apart. The business side of interior design, combined with the design side can create some real challenges for those new to the industry. Without a mentor, Ms. Grant fumbled initially. She learned from her early mistakes and pressed on to achieve success. When asked about what pitfalls she encountered on her way to success, Ms. Grant was quite clear. “Oh my goodness, not really having anyone to bounce ideas off of was perhaps the hardest part. Not having someone to answer questions like, how do I do my contracts? How do I get myself out there? Who do I market to? What is my price range? There’s such an advantage in having a mentor that is well-read on all levels. Once I recognized that, it fast tracked my path to success in my design business. I grew my business more quickly and avoided all the pitfalls and obstacles that my competitors struggled with, because I had a great mentor that had ‘been there and done that’ before. His guidance was invaluable.”, she reflected. Whether it’s measuring for tile, knowing product applications and specifications, measuring for draperies, furnishing sizes, deciding what fabrics should be used on sofas versus draperies…a designer entrepreneur has to know what he or she is doing, or they can get into a lot of trouble. As for what’s next for Ms. Grant and her company Designing Lives International, she is paying it forward by imparting her vast knowledge and experience in the interior design field to recent design graduates as well as emerging interior design talents through a licensing opportunity as a DLI Design Director. 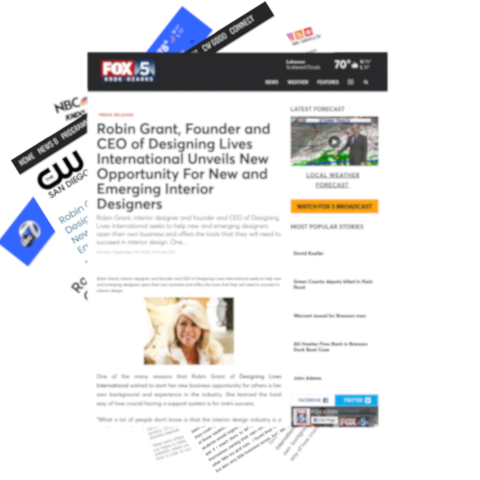 Listen to “Interior Designer And Entrepreneur Robin Grant Expands The Designing Lives International Brand Offering Licensing Opportunities” on Spreaker. 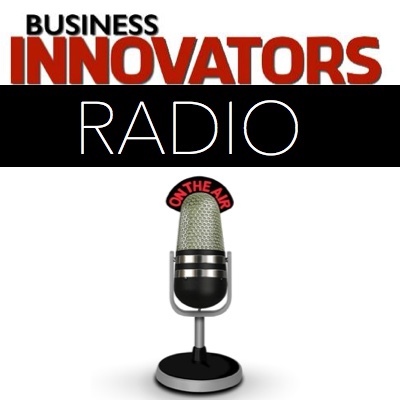 Listen to Robin Grant’s interview on Business Innovators Radio about her Design Director licensing opportunity for up and coming interior designers and established firms ready to rapidly expand their business. One of the many reasons that Robin Grant of Designing Lives International wished to start her new business opportunity for others is her own background and experience in the industry. She learned the hard way of how crucial having a support system is for one’s success. During her on-going career as an interior designer, Robin Grant has always been very busy. She was the designer for a LEED-Certified Mercedes-Benz dealership, designing pain-management clinics and restaurants, though the majority of her business came from designing very high-end custom homes. And she was very fortunate that the business just kept coming in. But at times there was simply not enough of her to go around. She has the expertise to properly mentor emerging designers both from her experience as a designer herself, having been featured in numerous high end publications, and as CEO of her own company, Designing Lives International. Her experience spans 20 years in the design field as a successful designer, mentor, and coach. “As my business grew, I reached out to students at the University that needed a mentor and to intern at a working firm as part of their education. I saw this as a way to have them help me and they could learn the business from the inside. It worked out great but I soon realized that while many of these students had raw design talent, almost none of them knew anything about business. These students would regularly tell me was that they wanted for themselves what I was doing. They would ask if I teach them to be in business for themselves? Because they had the vision. They saw themselves owning their own companies. They just had no idea how to get there, and also all the other little ins and outs. I found they had many things they were unprepared for, not only in design but also very little business sense, too”, Ms. Grant continued. “So, I decided that it was really time for me to pass the torch, to teach others how to build what they’re looking for in their lives and fulfill their dreams; how to become a wonderful interior designer, and have pride and integrity in the process. I’m looking forward to continuing this, but now in a more broad sense. I really want to help these upcoming designers along the way and teach them what they’re going to need”. The DLI licensing opportunity grants licensees exclusive rights to a particular geographic territory and includes direct coaching and mentoring by Robin Grant. Licensees benefit from a seasoned expert in the industry helping them with all aspects of starting/running an interior design business under the DLI brand. “I will be coming in to work in their market with them, to teach them how to become more visible in their territory. In the United States, we intend to expand one major city at a time, with only one or two major design directors depending on the size of the market”, Ms Grant explained. One of the many ways Ms. Grant helps potential Designing Lives International designers is by providing them access to her vast experience and knowledge in the industry, something most designers starting out typically don’t have much of– she also brings resources that they may not even know about, and helps them to avoid problems that most starting designers don’t even see coming. At its most basic, the core objective of the DLI opportunity is to help interior design entrepreneurs jump-start their businesses toward success. But for Ms. Grant, the most important thing she can teach her ‘mentees’ about is seeing success as an interior designer?